If you have diabetes and drive, there are a number of factors which can play a part in whether you need to inform the Driving and Vehicle Licence Agency (DVLA). There is a lot of confusion about what needs to be done and additional forms that need to be completed if you have diabetes and are applying for a licence. Essentially, you need to tell the DVLA about your diabetes depending on how it’s treated and the type of licence you want or are applying for. This section details the forms you will have to complete when applying for a driving licence and the conditions you must meet in order to receive a driving licence. If you don’t tell the DVLA about your diabetes or any other medical conditions that affect your driving when you should, you can be fined up to £1,000 and could even be prosecuted if you are involved in an accident as a result. This video is a guide on how to complete Form D1: Application for a Driving Licence. All additional forms or questionnaires that you may need to complete are detailed in further video guides that you can see at the end of this video. If you are applying for a car or motorcycle licence, you only need to tell the DVLA about your diabetes if your diabetes is treated with insulin. You need to complete a DIAB1 form and send it to the DVLA. Your diabetes is treated by any other tablets or non-insulin injections by also completing form VDIAB1GEN and sending it to DVLA. If you are applying for a bus, coach or lorry licence, the only instance in which you do not need to tell the DVLA about your diabetes is if your diabetes is treated by diet only. You can find all of the additional forms you may require on the Government’s website for diabetes and driving. Visit gov.uk/diabetes-driving to read more and download any additional forms. The form you need to complete if you are applying for a new driving licence or just updating your existing licence is called the ‘Application for a driving licence’ form or D1. First select what you are applying for and mark all boxes that apply. If you are renewing your licence as a result of moving onto insulin or due to your eyesight or another medical condition, put an X in the ‘for medical reasons’ box. Continue to complete section 2, titled ‘Your details’. Once you have completed section 2, move onto section 3 which is about your eyesight. You must be able to read a car number plate from 20 metres by law, with or without glasses. Put an X in the appropriate boxes. Section 4 is titled ‘Your health’ and is the part of the form you specify any medical conditions that can affect your driving. Put an X in the appropriate boxes for any medical conditions you may have. Remember, you only tick the diabetes controlled by insulin box if your diabetes is treated with insulin. Be aware that if you are applying for a car or motorcycle licence, you do not need to tell the DVLA if you have retinopathy in one eye. However, if you have retinopathy in both eyes, you need to complete Form V1. This form is also used for reporting other medical conditions such as cataracts, glaucoma, macular degeneration, retinal treatment and other related conditions. Section A in the notes explains the legalities and processes that may occur if you have declared a medical condition. Be aware that you may be required to complete additional medical questionnaires if you declared a medical condition. You may wish to download and complete these form alongside your driving licence application by visiting gov.uk/health-conditions-and-driving and downloading the appropriate questionnaires. Finally, once you have completed section 4, fill out section 5 which is your proof of identity and then section 6 if necessary. Once you have done that, date and sign your declaration on section 7, add a photo if required and then check section G in the notes to see where you need to send your driving licence form to. This section also tells you any fees that need to be paid. Once you have the appropriate payment and address, double check your form, make sure you have completed any additional questionnaires if required and then pop them all in an envelope to the DVLA. Your driving licence should arrive within 3-4 weeks. If you would like assistance with any of the diabetes related questionnaires, watch our other driving with diabetes videos to see how to complete them. Download our FREE guide on how to complete the Driving Licence Form (D1). If you treat your diabetes with insulin, you must by law inform the DVLA. You will need to obtain or download a form called ‘DIAB1’ which will ask for more information about your diabetes. This will include asking about the name and address of your General Practitioner or consultant. They will also ask for your permission to approach these people directly, if necessary, to obtain information on your fitness to drive. This does not mean, however, that you will be refused a licence. Watch the video below to see how to complete the DIAB1 form. Applying for a driving licence can be confusing at the best of times. And when you have diabetes, it can be slightly trickier. Essentially, you need to tell the DVLA about your diabetes depending on how it’s treated and the licence you want or are applying for. Section A in the notes explains the legalities and processes that may occur if you have declared a medical condition. Be aware that you may be required to complete additional medical questionnaires if you declared a medical condition. You may wish to download and complete these form alongside your driving licence application by visiting gov.uk/health-conditions-and-driving and downloading the appropriate questionnaires. 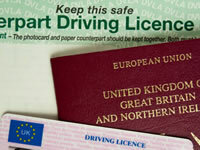 Your driving licence should arrive within 3-4 weeks. If your diabetes is treated with insulin, a driving licence will be issued for one, two or three years, and will you allow you to drive a vehicle up to 3.5 tonnes. When this licence expires you will receive a reminder to renew the licence and you may also be sent another Diabetic 1 form to complete with more up-to-date information. Renewals are free of charge. If your diabetes is treated with tablets, you are not always sent the Diabetic 1 form. In general, you will be issued with a full driving licence, providing that you do not have any other medical condition that might prevent this. There is a charge for renewing this licence after the age of 70. This is the same as for anyone else in the UK who does not have diabetes. If you have gestational diabetes and are put onto insulin temporarily, you need not inform the DVLA unless the insulin usage continues for more than 3 months or if you experience disabling hypoglycemia. If you take medication to control your diabetes, you will need to inform the DVLA and fill in a ‘VDIAB1SG’ form. The form asks a number of different questions about how your diabetes is managed as well as asking for details of your GP and consultant. No episodes of hypoglycemia which have required assistance whilst driving within the last 12 months. You must undertake to regularly monitor your blood sugar levels at least twice a day and at times relevant to your driving. If your application is successful, then you will need to continue to monitor in this way, particularly at times relevant to driving larger vehicles than cars or motorcycles. Every 12 months, you will need to arrange to be examined by a hospital consultant who specialises in diabetes. At the time of this examination, the consultant will need to review your blood glucose records for the previous 3-month period. You must have no other medical condition which would bar you from driving these vehicles. If you are unsure whether or not you are able to apply for this licence, contact the DVLA directly.